Racecar drivers know safety and more importantly, they know Arai. Arai is a leading helmet brand in the motorcycle industry and is a dominant player in the F1, Indie and NASCAR® Circuits. It’s no wonder that Arai is in demand by some of the top racers in motorsports today. 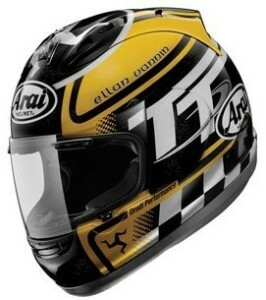 Arai has unequaled customer satisfaction, coming in at 13 by the J.D. Power and Associates Motorcycle Helmet Satisfaction Studies. There is a difference with Arai—the foundation principles of protection formulated over 3 generations have never been forgotten in six decades of helmet designing and manufacturing. While most companies are in a race to make stylish and less expensive helmets, Arai focuses on quality before style. Without a doubt, impact absorption is one of the most important functions of helmet protection. Arai believe that using a smooth, round and even shell offers a better chance for protection, allowing the helmet to glide more easily without odd twists and turns. Exceptional shell design is a key factor in helmets as an accident can come from any direction, at any speed. Each Arai helmet is 100% hand-made in three quality-control departments, following the arduous process of making the shell, painting/graphic completion and assembly. You can rest assured that the attention to detail of each helmet is paid due as each helmet has a different hand signature from the person who forged it. Arai has made helmet design into somewhat more of a culture than a task. Most companies that deal with the construction of motorcycle helmets think only of development prices. Another unique thing about Arai’s history is that the original creator, Hirotake Arai, was the son of a protective hat maker for policemen in Japan. He wanted to make more than just goods; he wanted to conduct his own symphony of high-quality and firsthand helmets using new techniques and materials. So, it came to be that he was the first to develop motorcycle helmets with fiberglass-Based Shells in the design, utilizing Styrofoam as a soft cushion to help line the helmet and absorb impact. You will find that as a consumer, there is nothing to worry about as the Arai Warranty guarantees a full 5-year warranty. This warranty length is hard to find in other manufacturers. If a company does not put trust in their product for more than a year, then why should you? Arai differs from most average helmet structures with a fourth layer of defense that is offered to riders in their helmets. This revolutionary feature will help protect you from different forms of impact, including high-side, low-side, glancing blows and direct impact. In most situations, the rider would suffer a brain trauma from impacts at high speeds. In fact, the number of deaths from motorcycles compared to cars is 30 times more (according to the National Highway Traffic Safety Administration.) You may not always be able to avoid an accident, but, essentially, you have a safe accident. This means that what would have normally been a fatal experience can be turned into a minor mishap. The fourth layer of defense works by carrying 12 times the amount of impact, which most helmets do not allow without drastic and costly changes. Thus, the R75 concept was thus applied to Arai helmets in order to maintain the R75 radius as such as possible. The Arai standard means that the shell will be based off of a continuous convex curve. This curve has a minimum radius of 75mm, in order to get the desired R75 shape. The Arai Company’s helmets come in nine different designs; each made to accommodate the shape of your head and safety standards. Arai’s XD4, Corsair V and other helmets are based upon the R75 shape concept, maintained shell thickness all-around and contouring to the head in the best way possible. For instance, the Signet-Q helmet consists of 13 features and techniques rarely put into a helmet all at once. Testing feedback finds that the contour is not only comfortable due to brow vent channeling, but also the new FCS (Facial Contour System), Hyper Ridge circles and so much more. Inside their entire helmet line, Arai takes researched innovation and applies it to each helmet to ensure that each helmet is optimized for improved strength and aerodynamics during the most crucial of times. These helmets were designed in terms of what could happen instead of what usually happens, in order to increase the survival-rate from accidents. With safety in mind, Arai does not just make helmets, but also continues to wear and represent their own company with pride and trust. You may not be able to always spot the reasons for why Arai feels better, but they’re always there: a lower center of gravity for less strain and increased balance, an aerospace fiberglass-based construction for less weight, softer single-piece and multiple-density liners for increased comfort, a ventilation system that actually works outside of the drawing board and overall, a helmet that has only major and no, “minor,” parts in the design process. All these reasons may be why you can’t put a, “price,” on Arai helmets. 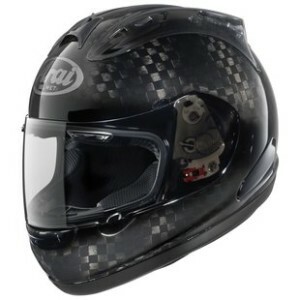 Arai helmets were made to feel comfortable for everyday use and feel good for years to come. This comfort surpasses that of cheaper helmets which become loose and shabby even after just a year’s use. Instead of going through a bunch of cheaper helmets in the lifespan of an Arai helmet (5-year-warranty), why not save in the long run instead of spending more? With the economy, people find it often hard to spend for themselves and own some of the best things in life, but with an Arai helmet you can finally own something that you can be proud of. Considering all the different pieces of work that go into the making of an Arai helmet, it’s no wonder that the price is nothing other than a bargain. On top of this most Arai helmets are just plain cool. Arai helmets are considered best motorcycle helmets on the market – here are some interesting things about what it means to be part of the Arai crafting team. Each part of the helmet is built by hand and goes through a 27-step process, consisting of arduous and timely individual jobs. Each member knows that all parts are never minor, but an importance to the design of the helmet all on their own. Sometimes it can take up to 5 years to earn the right to create an Arai shell. A lot of helmet companies can claim that they make high-quality and prodigal motorcycle helmets, but Arai by itself can also claim the right to unparalleled world-class technology, reputation and quality that is used by more than half of the drivers that race on the Formula-1 grid. You can easily find NASCAR® heroes like Jeff Burton, Juan Pablo Montoya and Jeff Gordon proudly wearing the Arai brand. Arai alone dominates areas in the world of motorsports that others cannot even begin to conceive of competing in. So, if you’re looking for quality and sheer effectiveness when it comes to protecting your nut then look no further than Arai.